For those who don’t understand the moniker, that is the nickname given by MSU alumni to fans of the University of Michigan sports teams who did not attend the school and its assumed that they purchased their apparel from the local Wal-mart instead of on campus — which I take offense to, LOL, I have purchased a lot of apparel from the university affiliated M-Den store. And while my diploma may not have the University of Michigan seal on it, that does not diminish me as a fan of the Maize and Blue. My earliest recollection of following the team came in 1989 while watching Raghib “Rocket” Ismail of Notre Dame run up and down the field for two touchdowns and despite the loss to the Fighting Irish, I was hooked. My dad had friends that attended the school and in 1990 I had the opportunity to see them live. Ironically the game was against in-state rival Michigan St. and even though they were robbed in the end — Desmond was tripped — I can remember leaving the stadium solidifying my fandom. Maybe it was because they were always on ABC and I can recall hearing Keith Jackson announce Tyrone Wheatley as the MVP of the 1993 Rose Bowl, but it seems like I grew up with my Saturday’s revolving around Michigan football — even during the dark days of Rich Rod and Brady Hoke. While in high school each of my parents had a school that they wanted me to attend — my mom was pro U-M and my dad wanted me to attend MSU — and because of my love for the sports programs they both thought I was a shoo-in to apply to U-M. But I had to think big picture; I had previously attended summer enrichment programs on the campus of both schools but didn’t feel the connection that I did when I took the on-campus visit to Eastern Michigan, so I became an Eagle. Choosing EMU actually increased my fandom for the Wolverines as I was only minutes from the campus and was able to celebrate each week on the journey to a National Championship in 1997. Each Saturday I would watch the team win in the afternoon — even made it into the Big House to see them beat Baylor — and then make the drive up to A2 to party with the team at the Elks Lodge. So my fandom is 25 years deep and I have done things in the name of being a Wolverine fan that even some alumni can’t say that they have (been to a bowl game, seen the basketball team play on the road in the ACC/BIG10 challenge.) So who is the real fan? It’s easy to “support” a school that you are paying tuition to. I’m guilty of it when it comes to EMU athletics; yes I get that their teams haven’t been the most successful over the past 10 years but even when I was on campus I only followed the teams casually. Even now I only check the box score on Saturday’s to see if the football team loss by less than 21 points. 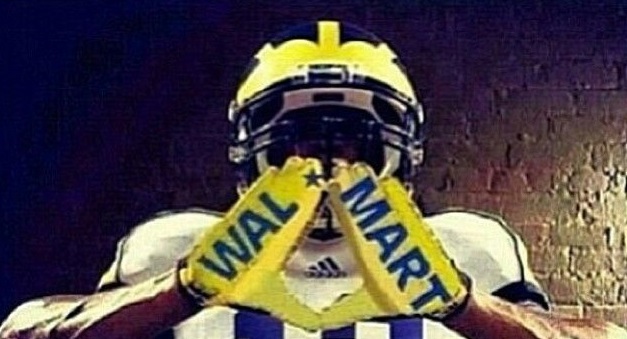 And keep it 100, some of you grew up as U-M fans and only switched because you went to State. If I didn’t know better the smug “if you didn’t go there, you have no right to speak” comments would make me think many of you had an inferiority complex — oh that’s where the “Little Brother” comment may have developed from. And while Mike Hart has had to eat his words over the past seven years, you have to realize its not just MSU that carries that stigma. Whether its Auburn/Alabama Texas/Texas A&M Oregon/Oregon St. or even Virginia/Virginia Tech, there will always be a school within an in-state rivalry that has more national notoriety, which will attract more fans that may not have attended that school. I get it… players and definitely fans can be jerks in their fandom, but that goes with both alumni and whatever catchy low-budget nickname you give to outsiders. I’ve learned from being on social media that sports fans are rude obnoxious and downright disrespectful… and many of them graduated from the school they cheer for. Truthfully over the past seven years that section of MSU fans that did not attend MSU has started to grow more as the team became more successful. Some are bandwagon jumpers but you also have to consider a generation of kids that only know of MSU as the top dog in the state. So to those who mock “Wal-Mart,” what will you say about those who will never spend a day in Hubbard or Holden Hall, won’t know what it feels like to attend a house party in Cherry Lane Apartments and never even apply to the school… will you shun them too? You must realize this MSU alumni, the goal of any athletic department is to grow its fanbase so that extends beyond you. Nike isn’t giving the university millions of dollars to only sell “Alumni” t-shirts. They want the support of the sports teams to evolve so that a kid in Tennessee will say that Connor Cook is his favorite quarterback or that a 10-year-old in Snellville GA will fall in love with Spartan Green because two local stars played ball there… even if neither will ever step foot on campus. So as we countdown the time before the kickoff Saturday, I get that you alumni feel a deeper connection to your respective school and you will have memories that no one else will understand — which is why even I hesitate singing the cheer “It’s great to be a Michigan Wolverine.” But know this, you attending the school of your favorite college team just means that you paid $30,000+ for your t-shirt while I paid $20 for mine… and on game day no one can tell the difference.